My first How To article has been published! I am pretty excited to share that I have just had my first jewellery ‘how-to’ article published on Craft Found.com. 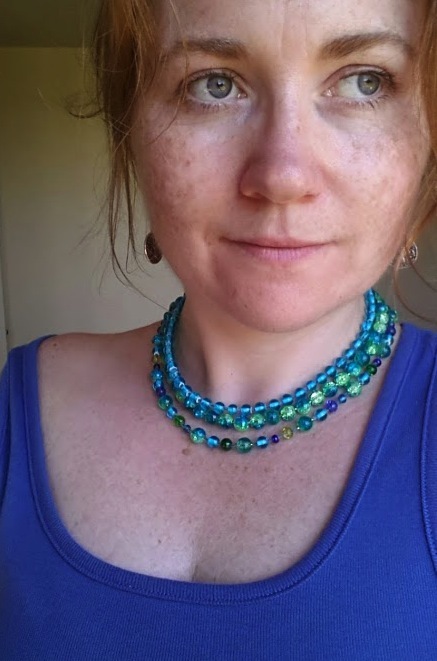 Yesterday, I made a matching necklace and earrings. I took time to photograph each step (as much as I could with one hand) and this morning I put together a how to on the article platform. It was published within seconds. Here’s the article if you want to check it out. I’d love you to as I am so excited that had it published. Thanks so much and I hope you have a wonderful day! 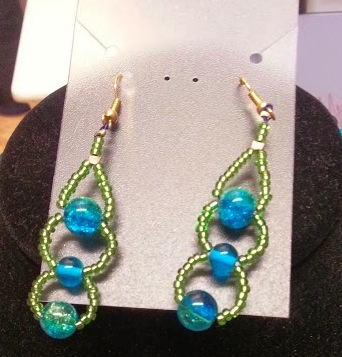 I am excited to share my latest beaded jewellery creations. Here they are below. These were a lot of fun to make. I particularly like the necklace that has the bigger Cherry Quartz crystals featuring in the design. I hope you like the too. Recently, as I was sitting at my favourite coffee shop, Nerosso Cafe, down at the Redcliffe Jetty on the Peninsula where I live, I happened to see a sign that truly took my attention. It was an image of a brown bear walking through the fields and the logo said ‘Little Bear Brown’. I was intrigued. There was something… special about that sign and I knew I had to go check out what it was about. 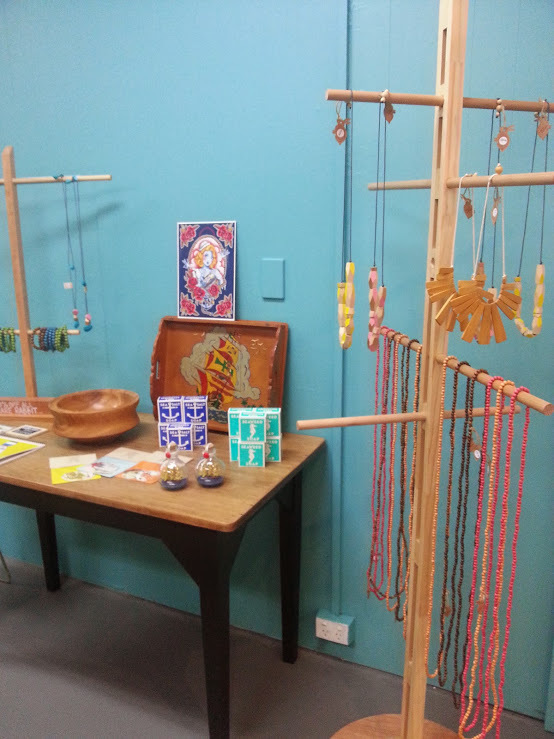 So, after coffee was done, my best friend and I went down to have a look and we found an exciting new boutique shop that retails home decor, gifts and jewellery. While browsing, I got talking to the owner, Georgie, who is the loveliest person, about my art and selling items that are one-off. 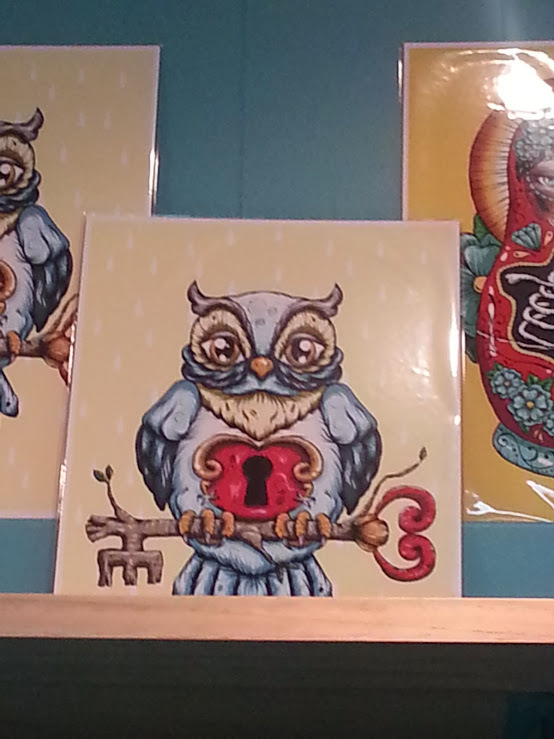 It was a great chat and I also purchased a laser cut owl necklace/pendant before leaving that day. I get lots of compliments about this jewellery too. Anyway, Georgie was making little pompoms for her shop display as we were chatting and I love that, as I love any form of creative expression and all the better when it is for something that represents your own unique-ness in the world. 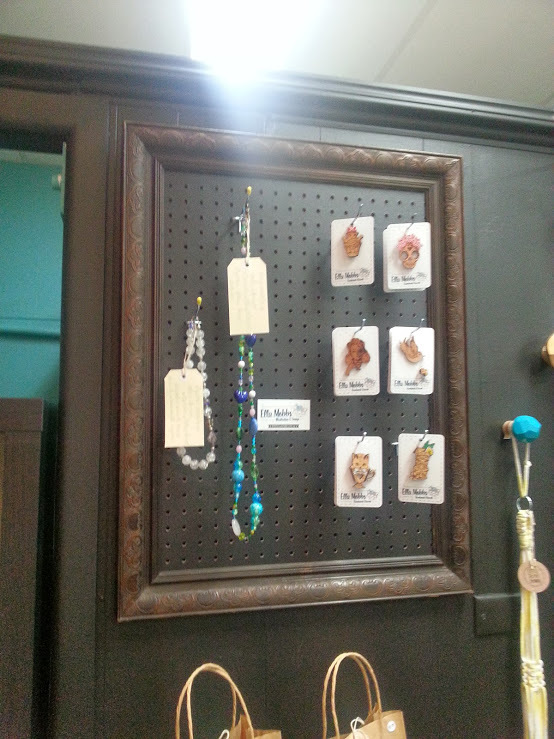 As a result of this chat, I am proud to say that I have some beaded jewellery items selling through Little Bear Brown! Thank you Georgie for supporting a local artist. I am very grateful. 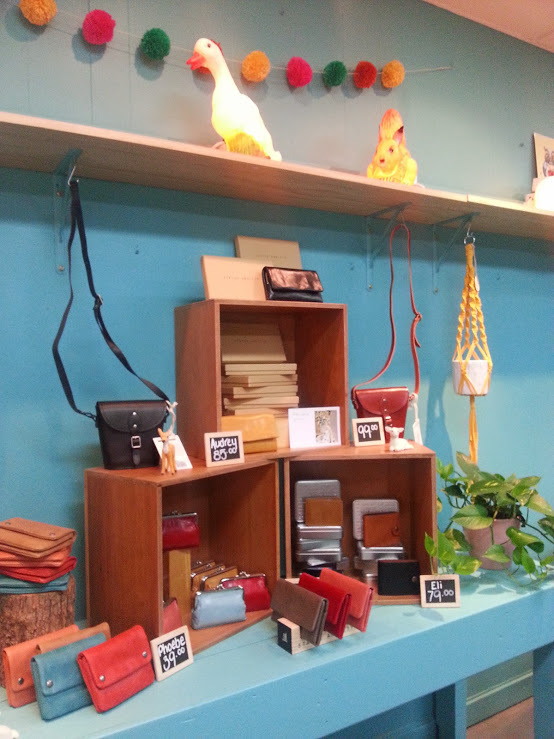 Apart from the small amount of items I have added to her shop collection, Little Bear Brown has candles, wallets, bags, hand-made items by Georgie, stunning laser cut jewellery from Polli (which I just had to buy and love wearing) and so much more. There are very cool lamps available too – lambs, ducks, bunnies and there is even a very cool skull! 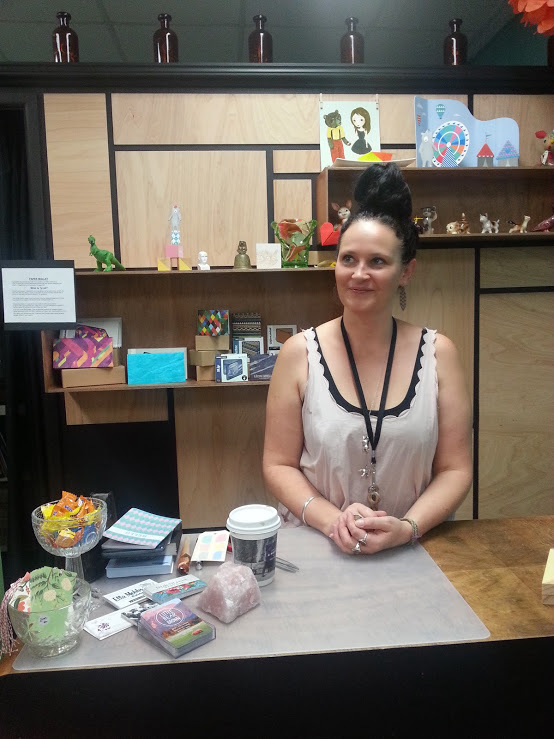 Little Bear Brown has only been open for four weeks and it is great to see many people going into this specialist boutique gift store and appreciating the items for sale. It’s even more exciting to hear their positive comments as they have a closer look at the unique items available. The energy of the shop is very warm and inviting and if you need something special for a gift (even if that gift is for yourself – all gift giving is valid in my world! ), make sure you get down to Little Bear Brown. All the products are fabulous and excellent quality. When I asked Georgie, how she got the name Little Bear Brown, she told me that they named it after their pet bull-dog, little Bear. How cool is that! I wanted to know where Georgie got the idea to set up such a great store? So, of course, I asked her. I admire Georgie for stepping out and creating something that she wanted. It is inspirational to meet more people in the world who are not only chasing after their dreams but making them into a tangible reality. Thank you Georgie for allowing me to write about Little Bear Brown. I thoroughly recommend your shop and I wish you great and profitable abundance. Little Bear Brown Store is exactly the type of business that I love to support because they are following their heart and obviously they love their own little Bear. 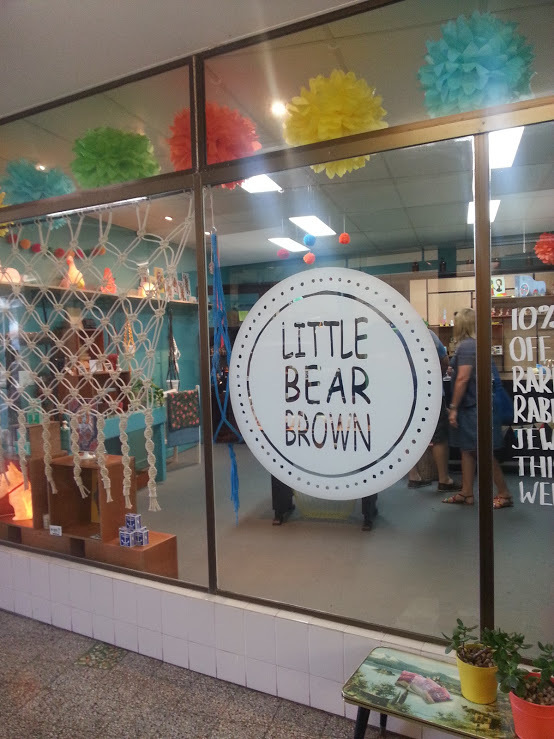 So if you want to know more about Little Bear Brown Store make sure you go to their Facebook page and ‘LIKE’ them and if you can visit in person, go check out the store at Jetty Arcade, 139 Redcliffe Parade, Redcliffe QLD. Recently, I have discovered a new creative passion and I am very much looking forward to investing some time into exploring Precious Metal Clay Jewellery making. 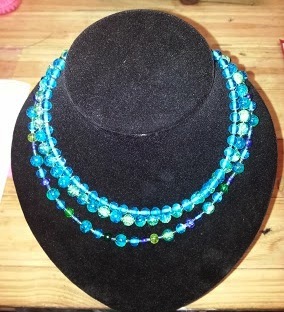 As I was flicking through a jewellery magazine, as I am want to do from time to time, I came across an ad for an online Jewellery Making self-paced subscribe course. It’s called ‘At the Bench’ and they take you step by step through the experience of making jewellery from precious metal clays, resin and glass. Of course, I joined up pronto as I have had a hidden passion and desire to create my own precious metal clay pieces of jewellery art and fully intend to jump into this wonderful new creative expression. So, I will be saving up some spare cash to invest in the basics and get going with my own projects, which, of course, I will share with you here. Here is a video from At The Bench. This is an awesome resource for learning new creative skills and you might enjoy some creative play too! Watch this space for some exciting new Selina’s World Creativity that will be coming your way. I spent the weekend creating jewellery. 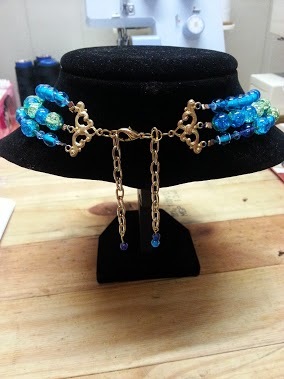 A triple row glass beaded necklace with gold toned findings and a gold toned chain. I fell in love with these crackle two toned beads. They look like the ocean on a beautiful sunny day. The necklace can be expanded if required as I put a lobster clasp on the back. It is a truly stunning piece of jewellery. At least, I think so! The above photo shows what the necklace looks like from above, looking down. This is an image of the clasp and chain at the back of the necklace. Here are some matching earrings that I made with gold toned earring hooks and plastic backings. 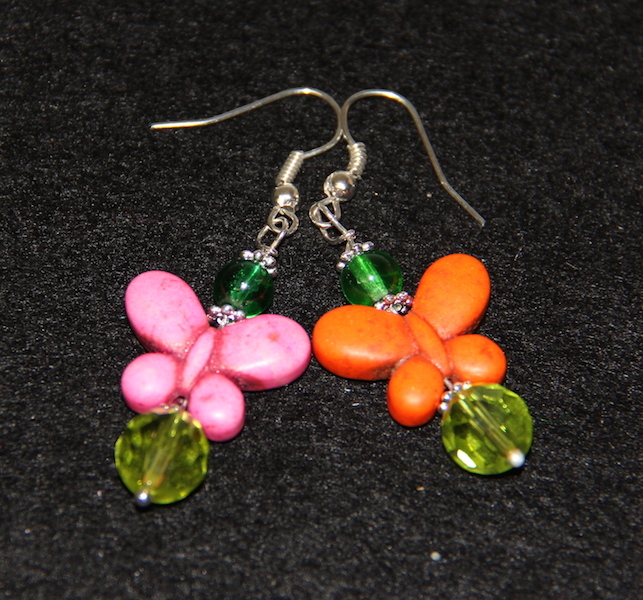 They are for sale on my ETSY shop if you would like to purchase them. 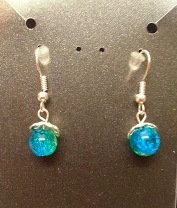 These silver toned earrings with simple blue and green crackle glass beads were sold this morning. They are very pretty and look stunning on!